Named one of the hottest bands of SXSW 2013, Black Violin will bring their rich blend of classical, hip-hop, rock, R&B, and bluegrass music to Smothers Theatre in Malibu on Wednesday, February 1, at 8 PM. Wil Baptiste (viola) and Kev Marcus (violin) are a string duo from Florida with equal footing in the worlds of classical music and hip-hop. Known together as Black Violin, they use music to break down the barriers and stereotypes that frequently form due to differences in race, economic status, religion, and more. Since their debut, in additional to their touring performances, Black Violin has scored and composed for the hit Fox television show Pitch and HBO’s Ballers, as well as served as the in-house band for the 82nd annual Heisman Memorial Trophy presentation. 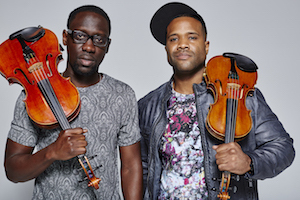 The members of Black Violin first met in Ft. Lauderdale, and played together in the orchestra at Dillard High School of the Performing Arts. Classically trained by day, they faithfully put on their headphones and listened to the hottest rap records each night. They went to different colleges— Baptiste attended Florida State and Marcus attended Florida International University—but the two reconvened, moved into an apartment together, and started trying to produce other musicians’ work. Since winning at the Apollo, they have toured with Mike Shinoda of Linkin Park, opened for the Wu-Tang Clan, scored an episode of CSI: New York, and even performed for President Obama at his second inauguration in 2013. Individually and together, Baptiste and Marcus have worked with everyone from Kanye West to Tom Petty, Lupe Fiasco to Aerosmith. Ticket prices range between $10 and $45, and are required for attendance. For additional information about the performances, and to purchase tickets, visit the Center for the Arts website.